On 18th September, 2014, a memorandum held in the Great Britain on the basis of the independence of Scotland. It was a great choice for Scotland to be an independent country because it was a historic memorandum for Britain within about last 300 years. The Great Britain and Scotland are united from 1707. But at recent, the people of Scotland wanted to be an independent state. If this memorandum become positive on behalf of Scotland’s independent then it could be brought hopeful reflection for pro-independence supporters of Catalonia in Spain, Quebec in Canada and also can raise the demand to hold a memorandum in Kashmir. Due to the memorandum of Great Britain, the elder leader of Kashmir (which is controlled by India), Saiyed Abdur Rahman Gilani already said ‘to arrange a memorandum like Great Britain on 20th September, 2014, because it has focused democratic features in the great Britain’. As the great democratic country in the world, India could be arranged a choice table for pro-union supporters and pro-independence supporters to choice their fortune what the next happens in Kashmir. Now, it is important to come back birth of Scotland and build a union with the Great Britain. The Great Britain is also known as the United Kingdom (UK). It is an island nation in Western Europe which is made up for four different provinces that are not independent nations. They are England, Wales, Scotland and Northern Ireland. There are other 9 regions together with these 4 provinces. They are North East, North West, Yorkshire and the Humber, East Midlands, West Midlands, East of England, London, South East and South West. The Great Britain of United Kingdom was formed as a sovereign state in 1 May 1707 with the union of England and Scotland through the treaty of Union of 1706. The treaty of union stated that England and Scotland were to be united into one kingdom in the name of “The Great Britain”. Ireland joined with Great Britain on 1 January 1801 and formed the United Kingdom of Great Britain and Ireland. From time to time, the Great Britain has been extended. In 1922 the Irish Free State separated from the United Kingdom, leading to the latter being renamed the United Kingdom of Great Britain and Northern Ireland. 0n 1707, the Scotland merged with the Great Britain. Wales is another island of Great Britain. The United States of America adopted a unilateral declaration of independence on 4 July, 1776 and engaged in Revolutionary War between United States of America and The Great Britain and Ireland, its North American colonies. But Britain was defeated in Yorktown in 1781 and recognized the independence of United States of America in 1783. The relationship between Great Britain and Scotland is not new rather they have maintained 307 years a long journey of relationship. But, now the Scottish pro-independence people want to an independence state with the leading of Alex Salmond, a leader of Scottish National Party (SNP). So, it is important to disclose the relationship between these two provinces. In the general context of mind, there is more economical contest between them. But the language of the Scottish National Party (SNP) is just as modern and prosaic. At the Hugo Young Lecture in January 2012 SNP leader Alex Salmond said that he would make the case for independence ‘as the means by which the Scottish economy can grow more strongly and sustainably; by which Scotland can take its rightful place as a responsible member of the world community’. Independence will turn Scotland into a green energy producing financial power that leverages itself between the dollar and the euro. Salmond expressed again that from the treaty of union, England embraced a more neoliberal vision of society and economics. In the 18th century Scotland was the home of classical liberal economics. Following the 1707 Act of Union Scotland excelled in the fields of education, medicine, science and sociology, emerging as the chief motor of rationalist humanist reform, achieving increased commercial significance and an astonishing literacy rate of 75 per cent. Scotland enjoyed its glory days when it was part of the global free market. Moreover, if he wants to tap into historical bitterness, Salmond could find a lot more to exploit than just the Poll Tax. It is surely in such history that a nation distinguishes itself from another, not in its attitude towards renewable energy or its absence of tutorial fees. On balance this displays a sad ignorance of the Union’s own history. The Union vastly expanded Scotland’s global influence, to the point that Scottish fur traders dominated the politics and economy of 19th-century Canada, while missionaries like David Livingstone spread Scotland’s own brand of Protestantism throughout Africa. There is, then, a romantic case for the Union and historians should be making it. England and Scotland have always been like jealous brothers, full of boiling resentment and given to violent fights. 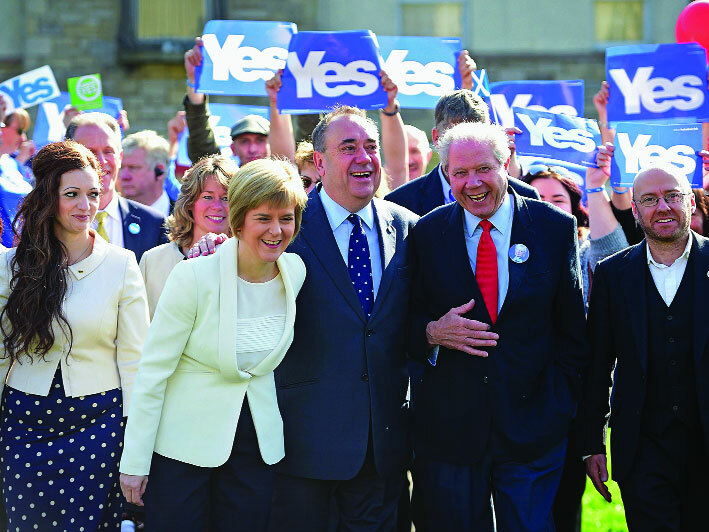 Nevertheless the nationalists have the upper hand in any referendum on Scotland’s future. For that cause, Salmond offers only a limited historical argument for independence. A historic memorandum has been ended where pro-union supporters are happy for uniting while pro-independence supporters console one another in sorrowful mind. We know that majority percent of people avoided the proposal of independence. But at first stage of referendum, majority predicts that Scotland is going to be an independent state. The final result is that the anti-independent “NO” camp secured a clear margin of 55.30 percent against 44.70 percent for the pro-independence “YES” side. Through the geographical location, there are 32 councils in Scotland, from which only 4 councils of Britain supported on behalf of independence. From these 4 big cities, 2 cities’ people supported on independence and another 2 cities’ supported on against independence. The majority people of Glasgo and Dandi margin on supported independent by “YES” vote and the majority people of Edinbora were against independence by “NO” vote. The statistical result shows that it is interesting that from 16 ages to 56 ages people supported on behalf of independent except from 18 ages to 24 ages voters. About 71 percent voters voted “YES” who are from 16 ages to 18 ages while only 48 percent voted “YES” who are from 18 to 20 ages. Majority elder people did not want to separate from Britain who is up 55 years age. Another statistic shows that the majority people of Glasgo and Dandi voted on behalf of independence where majority people are unemployment (accordingly 19.01 and 17 percent) while the total unemployment rate is 12.08 percent in Scotland. At the last time of referendum, pro-independence people are more exited to show the statistical figure but at the final end period the result is changed. So, the question is here, why they have chosen to stay in uniting? If Scotland becomes independence, then they will try to get membership of European Union (EU), but the negative reflection by EU leaders could not optimistic of Scottish people, so they have obliged to support Great Britain. The victory of this memorandum on behalf of Scotland was released from Britain but again captured by Belgium on the question of EU membership. Economic fact is also important fact. The Britain Government and other elder leader predict that economic recession will rise in Scotland after independence. But pro-independence supporters said ‘Scotland will be a successful state to run their economy through raising oil from North Sea (Scotland’s portion)’. But the general people of Scotland remind that a welfare state can run only by the powerful economic prosperity. A historic memorandum is ended, but, what next will happen? In any election, majority portions gain, but never mean that minority portions are worthless. In really democracy means to ensure rights and verbose security for minority not to endure majority’s oppression, rather to establish their expression through govern is main feature of democracy. Now, it is big challenge to figure on the minority’s expression of tongue. Just before referendum, the three main parties of the Great Britain promised to do new things and new propositions. On 16th September, Labor party’s leader Ad Miliband, Conservative party’s leader and Prime Minister David Cameron and Liberal Democrat party’s leader Nick Cleg promised to give imposing taxation and spend on Scottish parliament. They also said ‘if Scottish people want to stay united then we must take step to power decentralization as soon as possible’. On the other hand, it is important to implement promise for Labor party to conquer the next election to get support of Scottish pro-independence people. Salmond Alex, the leader of Scottish National Party (SNP), already stepped down from leadership of SNP and First Minister of Scotland; it is as usual democratic behavior. New leader will come and his first work will to ensure the demand of Scottish people where 16, 17,989 pro-independence supporters were wanted an independent state. What will do the next leader to establish their hope?